UTICA – Haneen Alsaad’s native language is Arabic, but the young Palestinian is making a name for herself with some impassioned speeches in her adopted tongue. Haneen is from one of several families of Palestinian refugees which call Utica home and after her naturalization ceremony on Thursday, she can now call the United States her home. Palestinians by the Israeli government since 1948. Haneen’s grandparents were among those millions. Her family, like all Palestinian refugees, still denied the right to return. 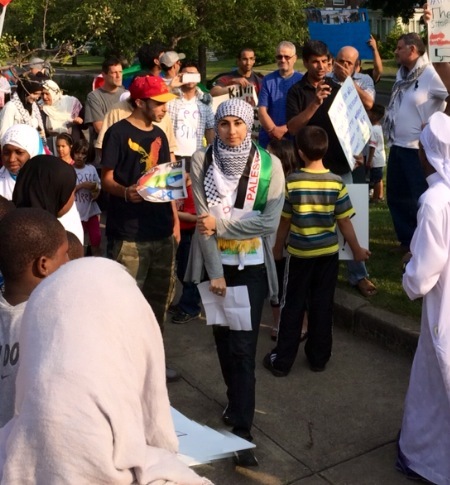 In the summer of 2014, during the Israeli assault on Gaza which killed over 2,000 Palestinians, Haneen was crucial in organizing the #Utica4Gaza rally which took place at the intersection of the Memorial Parkway and Genesee Street (and eventually became a march to Congressman Richard Hanna’s downtown office). There, Haneen gave a hell of a speech on the Israeli occupation of Palestinian territory. Later, she would help found Utica Peace for Palestine, a small group which aims to focus on news and events concerning Palestinian issues globally and locally. Good morning everyone, my name is Haneen. I feel very privileged and honored to be here today. I’m Palestinian but, I was born in Iraq. In 1948 when Israel took over Palestine they forced people to leave their homes and any other land they owned. My grandparents were among those people who had to lose their homes and had to leave Palestine for Iraq. My parents were born in Iraq and raised our family there. Because of the bad conditions in Iraq, my family moved to a refugee camp in 2007 on the border between Iraq and Syria. I lived there for three years. Life was very hard. It’s a desert –only tents , no houses. When it rained, it flooded. In the summer it was scorching hot. In winter, it was freezing cold. (The) elderly and babies died because they couldn’t endure it. Since the tents were made up of cloth, they would catch on fire quickly and easily, and as soon as one catches on fire the whole line of tents goes down with it, too. I lived under very hard conditions that I never experienced before. There are a lot of people who don’t know what “stateless” means. Stateless means, a person who is not recognized as a citizen of any country. Through my whole life i have never had a citizenship, even though I’m Palestinian I dont have Palestinian citizenship because I wasn’t born in Palestine and I dont have Iraqi citizenship because I wasnt Iraqi. We were not allowed to have one . Citizenship is very important in a person’s identity. Without it, it’s like a part of your identity missing. I always dreamed to have citizenship. To travel and do things that regular people do. Fortunately, today my dream came true and finally I’ll become a US citizen. I’m very grateful for the United States. It gave me the opportunity to become an American citizen and I’ll always be a good citizen for this country. I’m very lucky to be in America — I have accomplished a lot here. I graduated from high school and now I’m attending college. My life now is way better than it was a few years ago. I pray for the people who don’t have citizenship, that they may someday have the opportunity to come to this great nation and also become citizens. I feel very privileged to call this place home. Thank you so much, to the United States government, for accepting me as their own.